"The lives of great men are like legends-difficult but beautiful, "
Janusz Korczak once wrote, and it was true of his. Yet most Americans have never heard of Korczak, a Polish-Jewish children´s writer and educator who is as well known in Europe as Anne Frank. Like her, he died in the Holocaust and left behind a diary; unlike her, he had a chance to escape that fate-a chance he chose not to take. His legend began on August 6, 1942, during the early stages of the Nazi liquidation of the Warsaw Ghetto-though his dedication to destitute children was legendary long before the war. 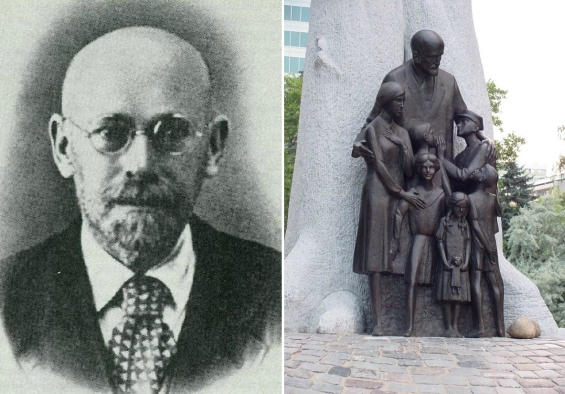 When the Germans ordered his famous orphanage evacuated, Korczak was forced to gather together the two hundred children in his care. He led them with quiet dignity on that final march through the ghetto streets to the train that would take them to "resettlement in the East" -the Nazi euphemism for the death camp Treblinka. He was to die as Henryk Goldszmit, the name he was born with, but it was by his pseudonym that he would be remembered. ~ Do not expect that your child will be just like you, or the way you want him to be. Help him to become not you, but themselves. ~ Do not ask the child to pay for all that you did for him. You gave him life, how can he repay you? He will give life to another, one – third, and this is an irreversible law of gratitude. ~ Do not vent your grievances on the child, so that old age does not have the bitter bread. For what you sow, so shall arise. ~ I do not look down on his problems. Life is given to each within their own abilities, and be sure – it is hard for him too, no less than you do, and perhaps more, since he has no experience. ~ Do not put down! ~ Do not forget that the most important meeting of man – his meeting with the children. Pay more attention to them – we can never know whom we meet in a child. ~ Do not torture yourself, if you can not do something for your child, just remember: not enough is done to the child, if not done everything possible. ~ The child – it’s not a tyrant, who takes possession of your whole life, not just the fruit of the flesh and blood. This is a precious cup, which God gave you to keep and develop it in a creative fire. It liberated the love of mother and father, who would not grow “our”, “their” child, but the soul, given for saving. ~ Know how to love someone else’s child. Never do to a stranger what would not want to be done to yours. ~ Love your child for everything – untalented, unsuccessful, grown up. Talking with him, rejoice, because the child – it is a holiday, who is still with you.